Charlie tells Hurley what Desmond told him about him dying, when Vincent comes out of the jungle with the arm of a corpse in his mouth. 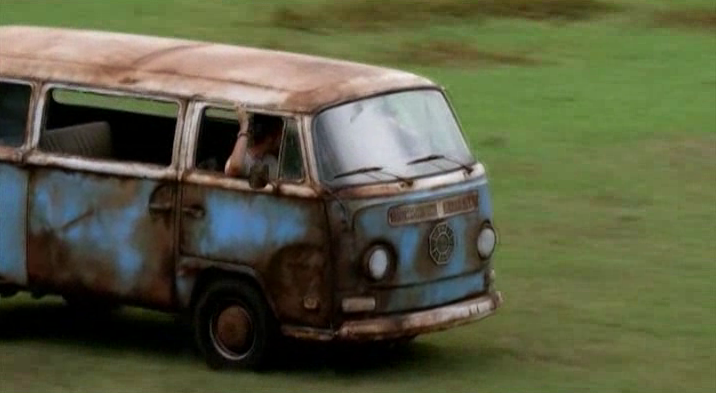 Hurley tries to chase him down, and comes across a broken down VW bus with the remains of Roger Linus inside. He heads back to the beach to try and recruit some people to help him get the bus started, being the self-appointed Ambassador of Fun and all, but the only person he can get to help is Jin, who doesn't understand him to begin with. Kate and Sawyer make it across the island and arrive back at the camp, and we get a vintage LOST reunion montage. Sawyer quickly makes the round accusing everyone of stealing his stuff, but quickly is recruited to Hurley's cause of fixing the bus. Jin is unable to get the motor started, but Hurley is convinced if they push it down a really big hill, he can get it started. And if not, he'll probably crash into the rocks at the bottom and die. He and Charlie head down and he's able to get the car started, and everyone's happy. Meanwhile Kate, always the diligent listener, immediately after getting back goes against Jack's wishes and heads back out after him. Locke and Sayid join her, and she recruits Rousseau after telling her about Alex. We had back off the island and Miles is with another client. After he's done, Naomi approaches him about a job offer. She takes him to a dead body to test his abilities, where we learn some apparent details about the faked Oceanic plane wreckage, including something about empty graves, and an old airplane being purchased. Naomi invites Miles to join the expedition to the island, and offers to pay him $1.6 million. Later he's intercepted by Bram and some of Ilana's people, who unsuccessfully attempt to convince him to stay away from the island. Back on the island, as the episode closes Sayid stumbles upon Mikhail's communications outpost. The episode runs 40:00 and is 332MB to download. You can stream the episode below (via Facebook), or go here to use torrents (better quality, recommended) to download the episodes to your computer.